As we all know, there is considerable evidence that exposure to lead as an infant interferes with brain development, producing teenagers and adults who are more impulsive, more aggressive, and less intelligent. But suppose you want to really prove this. Ideally, what you’d want is a randomized controlled trial in which a group of infants is split randomly in two, with one half exposed to lead while the other half isn’t. Then you wait 20 years and see what happens. Researchers placed a taxidermized mockingbird on a tripod, 25 feet away from nests that pairs of mockingbirds were constructing, a situation in which the birds act most territorial. The researchers also played recorded songs of singing males to alert the mockingbirds and make the intrusions more realistic. In the Lakeshore neighborhood, at the top of the map, the mockingbirds had an average aggressiveness score of about -1.0. In the Marigny and Uptown neighborhoods the birds scored 0 and 1.2. So there you have it. Lead is bad for human infants, and apparently it’s bad for mockingbirds as well. 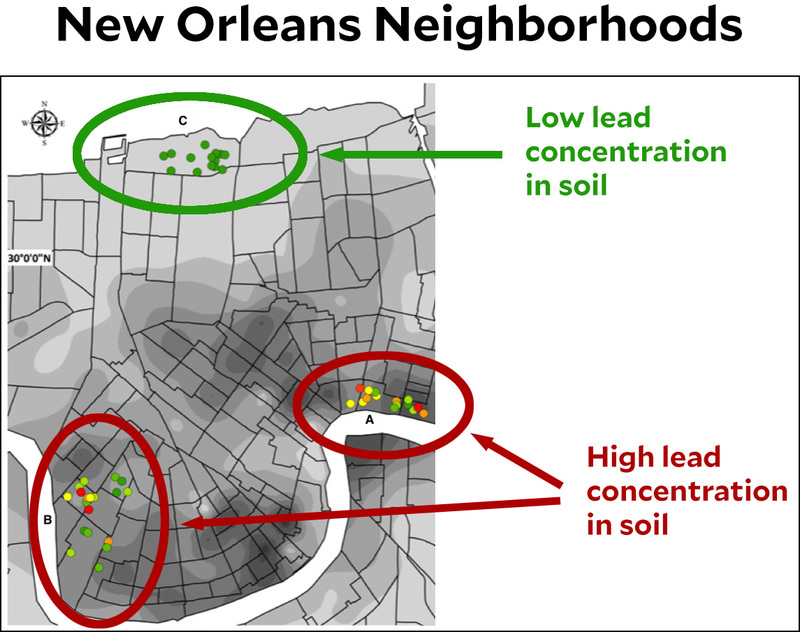 In both cases, the problem is lead in soil: human babies crawl around outside and then stick their hands in their mouths, while mockingbirds eat worms that have ingested lead particles. Either way, it’s bad news.